As I’m sure you know, the planned Treasure Hill development has the potential to dramatically change the look and feel of Old Town as well as detrimentally impact the quality of life for all those in Park City. The planned development includes the largest convention center space in all of Park City. Is this really the appropriate place for a convention center? Also, the Sweeney’s are petitioning the city to allow time shares on the property even though it was not originally zoned for time share units. All of this will only increase traffic on already narrow, congested and dangerous streets where pedestrians, pets and kids all have to share the roads with cars and trucks. However, there are still many Park City residents that have no idea as to the impact that Treasure Hill will have on all of us. To help in this cause, I have written Nan Chalat-Noaker the editor of the Park Record to encourage her to publish the renderings and more information about the development. The next planning meeting on 2/11/09 will be a critical one as traffic and safety issues will be addressed. This may be our only chance to voice our concerns regarding this important topic. As such, I’d like to encourage all of us to attend that meeting to voice your opinions and concerns. In addition, or if you cannot make the meeting, I’m hoping that all of us can take a few minutes to write your concerns to the city. The planning staff and commissioners need our input if changes are to be made. Finally, it would be great to send letters and comments for publication to the Park Record. Thanks again for your help and concern. This page contains: all previous Planning Commission staff reports, all meeting minutes, the original master plan staff report and meeting minutes, and the current staff reports as they are published. The applicant’s submittal documents are available at the applicants website: http://www.treasureparkcity.com. Hard copies of the submittal documents are available at the Planning Department. They must be viewed onsite. TONIGHT! Also, Park City is sponsoring a free workshop to help citizens understand, navigate and participate in the public hearing process on Tuesday, February 3rd at 6:00 p.m. The workshop will be held in Room 205 of the Library and Education Center at 1255 Park Avenue. It is free and open to all members of the community. Thank you for visiting THINC Park City’s new web-log. 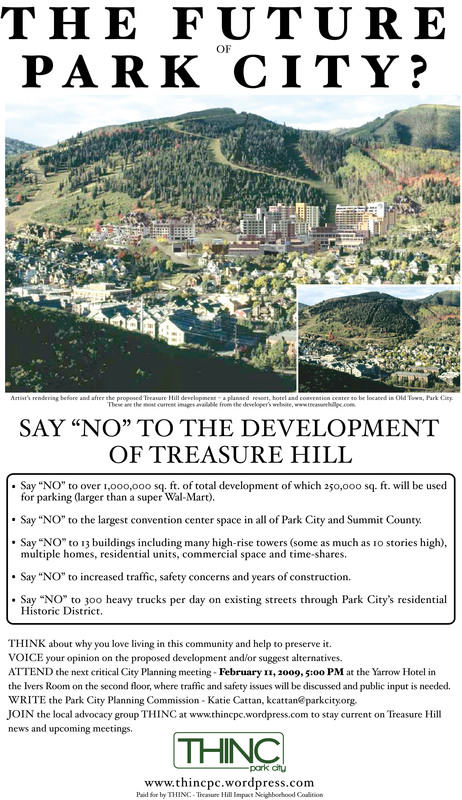 We are a non-profit organization working hard to inform Park City’s residents about impending developments such as Treasure Hill, that will effect the lives and well being of Park City’s Old Town residents. As we continue to update this web-log, we will provide you with tools to make your voice heard throughout our community. THINC about why you love living in this community and help to preserve it. Our new web-log allows you to get involved in many ways, you can VOICE your opinion, ATTEND critical meetings, WRITE to your city council, and JOIN the efforts to stop future developments that would cause too much impact on the town we all call home. In addition, you can stay up to date with current news and happenings by reading our BLOG. We have also provided you with links to other sources of information about our cause as well as links to the press and town officials so you can let them know that you say “NO” to the development of Treasure Hill. We are in the process of taking out a full page ad in the Park Record as well as seeking other avenues for our voices to be heard. Our local radio station KPCW provides another great forum to voice your opposition of the Treasure Hill development. You can call The Randy Barton Show between 4:30 and 5:30pm Monday – Friday to let listeners know that you oppose the Treasure Hill development, and hopefully start a dialog with other listeners. You may also comment on our own open forum in the VOICE section of our web-log. Thank you for visiting us at THINC and we urge you to get involved to help preserve what we love about Old Town Park City. I wanted to provide a quick update and some additional information that should be helpful in preparing for the next meeting on 2/11/09 (which will address traffic and safety issues). We are also placing our own full page ad in the Park Record with a large photo showing the true scale and scope of the project. Finally, to help provide some more background that may assist you in writing letters, etc., attached is the latest staff report on Treasure Hill and excerpts from the 1984 Land Management Code (used when Treasure Hill was originally approved). Of particular note regarding traffic issues: the purpose of the LMC is to promote safety (15-1-2 (A); The City shall not issue a CUP (conditional use permit) unless the use is compatible in circulation (15-1-10 (D) (2); the City shall not issue a CUP unless “traffic considerations including capacity of the existing Streets in the Area” (15-1-10 (E)(2). I hope this helps all of us to prepare our remarks for the important meeting on 2/11/2009. (A) To promote the general health, safety and welfare of the present and future inhabitants, Businesses, and visitors to the city. If the reasonable detrimental effects of a proposed Conditional Use cannot be substantially mitigated by the proposal or imposition of reasonable conditions to achieve compliance with applicable standards, the Conditional Use may be denied. 15-1-14. TERMINATION OF PROJECTS FOR INACTION. (A) TERMINATION OF APPLICATIONS. When the Planning Director finds an Application to be inactive, the Planning Director may deny the Application and close the files with respect to that project….